Australia's version of McDonald's, Macca's, appears to be the location of a market test for McDonald's new app, TrackMyMacca. The app fuses a technology called 3D augmented reality with the company's supply chain to surface information about the fast food content's source. Users point their app-enabled device at the fast food container and watch as information about the food products' past is revealed with dizzying precision. The app appears to be the next generation engagement tool (e.g. eye candy) that was once the job of clowns, elfs and other co-branded toys. It is surprising that a typical McDonalds customer cares much about the lowest-price vendors that made the 1,000 calorie meal possible. 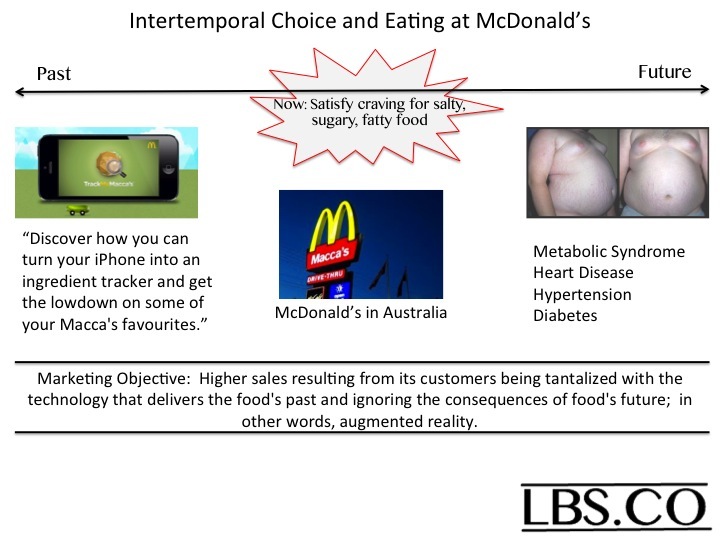 I suspect what McDonald's wants is higher sales resulting from its customers' being tantalized with the technology that delivers the fast food's past while ignoring the consequences of fast food's future; in other words, a new interpretation of "augmented reality." McDonald's use and new interpretation of "Augmented Reality"